Few gemstones in the world are as majestic to behold as a truly fine specimen of emerald. The depth and intensity of color in the finest gem emeralds is truly astonishing. Loose emeralds and emerald jewelry pieces routinely sell for staggering prices at auction. The tiara shown below (rumored to have been owned by the wife of French Emperor Napolean III) sold in 2011 for $12.76 million dollars! If you are considering investing in an emerald, it certainly pays to spend some time learning more about these magnificent stones. Columbia is the largest producer of gem quality emerald in the world, followed by Zambia in Southern Africa. Fine emerald is also mined in Brazil, Zimbabwe, Madagascar, Pakistan, India, Afghanistan Russia, and several other locations in the world. Emerald is the name for a specific variety of the mineral Beryl which receives its green coloration from small amounts of chromium or sometimes vanadium. Emerald is quite hard, scoring a 7.5-8 on the Mohs scale, however due to the typically high quantity of internal inclusions in emeralds, they are generally not considered tough enough for everyday wear in rings. Pendants and earrings are a perfect every day, wearable home for your emeralds. 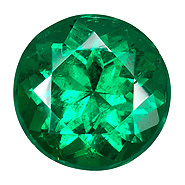 The vast majority of emeralds are oiled after faceting to improve clarity and stability. Oiling is a generally accepted practice, although non oiled stones of like quality will certainly command much higher prices. Vendors are required to disclose all treatments, including oil when presenting emeralds for sale in the United States. Unfortunately there are unscrupulous dealers who are always ready to take advantage of a potential customer. Like any fine, or investment grade gemstone, a gemological certificate from a trusted laboratory can be invaluable when looking to purchase an expensive emerald. Egyptian Pharaohs, Incan High Priests, Indian Maharajas and Spanish Conquistadors all number in the ranks of those who have gone to great lengths seeking these exotic natural treasures. Here at Pearlman�s we have made it much easier for you. Just click the image below and begin your journey.